Spider Snell at Kurtal in 2002, when the rain-making seems to have been too successful. “The documentary is an astonishing ten-year labour of love by film-maker Nicole Ma, documenting the fragile line by which endangered Indigenous cultures are passed from one generation to the next. The fragility of this slender thread has been observed in other films, but rarely with such compassion, honesty and richness of detail”. That's the official line from the film's distributor, Ronin Films – and it's no hyperbole! This slightly over-long examination of Wangkajunka reality from Great Sandy Desert nomadism to urban dissolution in Fitzroy Crossing is both brutally frank and desperately moving. It's also a rare sighting of true ceremony – rain-making that actually works – and proof of the significant links between the maintenance of ancient culture and the painting that, amongst other things, won the 'Big Telstra' this year in Darwin, Kurtal jila. For both this year's triumphant Dolly Snell and former General Painting winner, Spider Snell (her husband) developed their painting less as a way of achieving fame and fortune and much more as the only way they could maintain their connections with both the Kurtal waterhole, way down in the desert where she was born and he has ceremonial responsibility, and the rain-making serpent/spirit of the same name which inhabits and motivates that water supply. But as they age, how to pass on the lore so that Kurtal too won't die when they do? Enter Putuparri Tom Lawford – their grandson – also grandson of a white station owner, and (I assume) cross-culturally educated in Perth alongside his actor-sister, Ningali Lawford. I don't think anyone can blame that education on his later problems - about which he's devastatingly honest. A wife and three daughters don't give him stability, only pressures that he attempts to 'solve' with alcohol. And alcohol leads on to domestic violence, which leads to prison. In charming soliloquies shot during the film's decade-in-the-making, Lawford knows it's all wrong, and is being headed in the right direction by his grandparents and other elders, even getting involved in serious projects like the two-year national tour of the massive Ngurrara Canvas that's been painted by a dozen or so artists to prove their connection to Country sufficient to justify a land rights claim. He also makes significant trips to Kurtal with Spider. But none of this is enough to put him straight – only prison and a period on a remote cattle station gives him the time to think it all through, and to decide to take on his inherited responsibilities, “and that made me feel good inside”. It must be the story of so many young men in Indigenous townships. 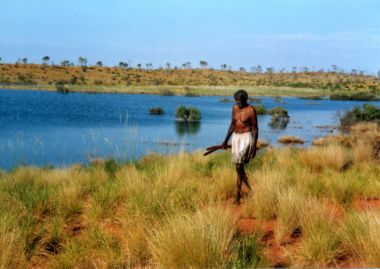 The first of the trips to Kurtal is in 1994, probably 40 years after the elders were first 'discouraged' from their ancient way of life by drought and cattle-men who arrived with the encroaching Canning Stock Route – one of many straight lines the kartyia imposed upon the much more complex Indigenous map. For, in Lawford's words, Canning had “imprisoned” the water in the wells which determined his Route. Amazingly, 40 years down the track, the expedition is able to find a “small wet patch” which is all that remains of Kurtal in the middle of a featureless (to my eyes) desert. Setting to, the old men dig it out, getting water to flow, bringing in birds, much mudding up of celebrants, dancing, fire, and before long storm clouds gathering. It's easy to see that these storm clouds are reflected in the dance head-dresses that are created back in Fitzroy to emulate the desert experience. Lightning flashes; everyone jumps into 4WDs and flees; and the heavens open. Next time they visit, Kurtal is a massive lake! Which is a worry – has Kurtal left the stage??? Spider burns the bush, sings and shouts, “Listen to your family”. And He does – more rain, ceremonies through the night, involving now a much younger Snell grandchild – Buster, who's steady maturing is a delightful feature of the film. His “first public dance” accompanying the Ngurrara Canvas's presentation in Canberra as a chubby kid is a serious joy – bringing back for me my introduction to Aboriginal culture at one of the great Groote Eylandt pan-tribal dance festivals in the 80s – the children's enthusiastic participation almost as important as anything their parents were doing. And it seems as though the aged Snells can predict their grandchildrens' fates – for it's revealed that both Lawford and Buster were painted on to the Ngarrara Canvas, dancing for Kurtal. But, sadly, those dedicated old people can't predict Kurtal's fate. For, after 15 years of slothful negotiation, a half-hearted final determination of their land rights claim accepts most of the Ngurrara Canvas's claims, but excludes Kurtal. It seems that another of the kartyia's straight lines doesn't accord with Wangkajunka reality. The spindly Spider is left bemused and bereft, and one of the problems for film-maker Nicole Ma is that she has no happy ending to wrap her documentary up with. 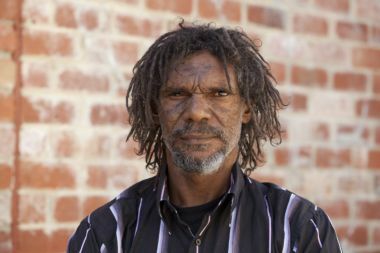 For Spider, as for so many Aboriginal elders, it's the tragedy of shouting “I'm the boss” to empty space in Fitzroy – his inheritors far too busy playing footy to follow his instructions to come and dance. Kurtal, too is still officially “vacant Crown land”. But Spider does get one last chance to farewell Kurtal – arriving this time by helicopter, and reminding me of a memorable helicopter tour of the East Kimberley I made with another great painter and law-man – Paddy Bedford – similarly farewelling his significant sacred and personal sites. This time – so close to a death that hasn't yet occurred – it emerges that the survival of Kurtal – both snake and waterhole – is vital for Spider's spirit, which will return there after his passing. All the more reason to hand his responsibilities on “to us young fellars – we'll be the next Rain-makers of the desert”, as Putuparri Tom Lawford now accepts. Watching this dreadlocked, conflicted man emerge, taking us through Great Sandy Desert and Kimberley history from Canning via the Noonkanbah mining protests that he attended to Ngarrara and beyond, to working with the Kimberley Aboriginal Law & Culture Centre, acting as cultural adviser on the huge National Museum Canning Stock Route Project, to leading a revival of the Majarrka Dance - “like bringing something back from the dead” - is refreshment for the soul. And it should be viewed by anyone foolish enough to think that the maintenance of Kurtal could possibly be lightly dismissed as “a lifestyle choice”. PUTUPARRI AND THE RAINMAKERS has been seen at the Melbourne Film Festival – which co-commissioned it – and will appear at selected cinemas from Oct 1st. I assume that it will also be screened on NITV, another commissioner. Don't miss it. Late News: If in Western Sydney this weekend, don't miss the screening followed by Q&A with Nicole Ma and Tom Lawford at Casula Powerhouse. It's at 2pm on Saturday. Tickets at https://www.tugg.com/events/89892. Back to the wall for Putpuarri Tom Lawford in the film, 'Putuparri and the Rainmakers'.